“The biggest selloff in stock market history” the article on CNN says. For months/years people have been buzzing about how you should own Google stock, Facebook stock, Amazon, and Netflix stock – it’s called the FANG profile. High tech, big numbers, zoom zoom zoom. All well and good. But, I remember the dot-com boom and bust. I remember Enron stock slowly (then quickly) falling to z e r o.
I don’t own any of the aforementioned stocks. I don’t own any individual stocks. This doesn’t mean I’m not in the stock market. I do own them as part of mutual funds. By buying mutual funds that cut across sectors of the market, you participate in most of the upside, while minimizing most of the downside. I’m sure one or more of my funds are down a bit today, but nothing like the 19% cave-in experienced by Facebook stock. 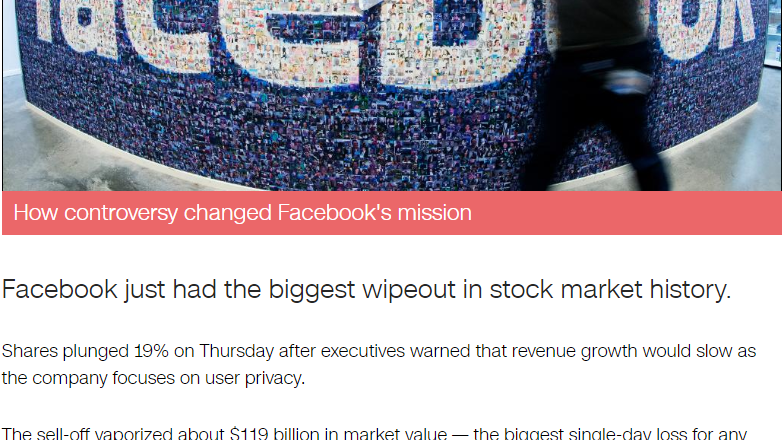 Will Facebook regain its value? No one knows. But I DO know, with a high degree of certainty, that my mutual funds as a whole will continue to rise. Year in and year out. My funds return more than the S&P 500 average. It is possible, because the S&P is an average. By definition, there are funds made up of stocks that do better. A good mutual fund broker will help you find them too, and cost you less than they make you. I’m not freaked out about Facebook stock in the least. And if you’re in mutual funds, and not individual stocks, you shouldn’t be either.